Rare and important piece of German social history. This book-shaped and hand-carved jewelry box from 1840-1860 is likely to be the only one of its kind. A 'poesie album' was a booklet mainly for children. It was also known as a 'Freundschaftsbuch (a book of friendship). In it, friends, teachers and loved ones would write rhimes and verses, often accompanied by pictures, drawings and ornaments. The 'Poesiealbum' reminds us (like a diary) with whom our life’s path (or a part there of) was shared. This also explains the heart shaped, mother-of-pearl inlaid key hole (there is no key). 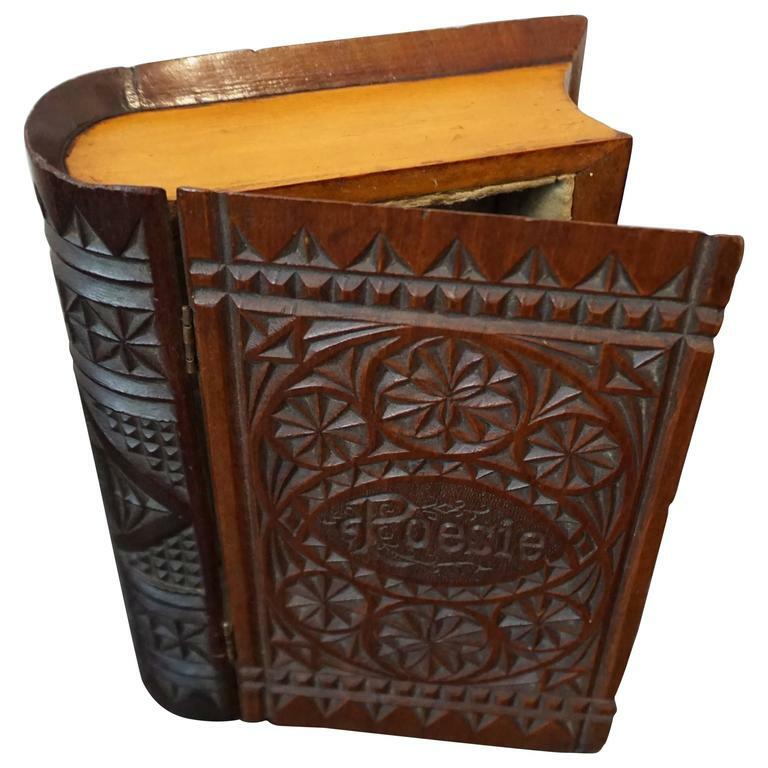 Because of the importance of the 'Poesie Album' in Germany (but also in the Netherlands) this jewelry box is a rare and important piece of social history for both countries. By the spelling we can see that this item is actually German. This rare jewelry box is made of beautifully carved mahogany and ashwood. Apart from some minor signs of wear and some very small and superficial damages it is in very good condition. The initials of its first owner are carved on the side and they spell CJT. Our fair price for this unique box even includes perfect packing and also worldwide delivery from our store to your door in just 4 days. Maximum length x width x height: 8.27 x 6.11 x 2.37 inches. We have a passion for the unique, for quality, for stylish yet practical and for craftsmanship of years gone by. Your purchases will be extremely well packaged and we look forward to serving you (again). You can shop our 1000+ listings by pushing the button that reads 'View All From Seller'. Jewelry case in the shape of a book with gold embossing at the spine and front. The paint is slightly worn. The red interior is perfect for small trinkets and jewelry of any type. The elaborately carved snuff box with a scene of two mermaids on the cover and deeply carved shell on the reverse.